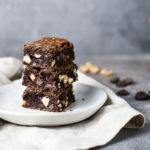 The ultimate in easy but decadent brownie recipes, these Chocolate Peanut Butter Brownies are ready to devour in under an hour, and might just be the best and easiest brownies you'll ever make! Preheat oven to 325 degrees. Line an 8x8 baking dish with parchment paper. Whisk the egg in a bowl. Add the brownie mix, water and oil. Mix to combine, being careful not to over mix. Add the peanut butter chips and toffee chips and mix until incorporated, being careful not to over mix. Pour the batter into the parchment paper lined baking dish and bake for 40-45 minutes, until a toothpick comes out clean. Remove and let cool for 1-2 hours (if you can). Slice and serve. Be careful not to over mix the brownie batter. Over mixing can cause the brownies to be tough. It's ok if there are a few streaks of flour in the batter. Use a toothpick to check for doneness. If the toothpick comes out clean, the brownies are done. If it still has batter on it, place it in the oven for another 2-3 minutes. Check again. For a chewier brownie, under cook the batter just slightly (1-2 minutes). Wait until the brownies are completely cool before cutting them to get the best results. I actually put them in the fridge for about an hour before I cut them. Warm a knife under hot water before cutting the brownies to make them slice cleaner.